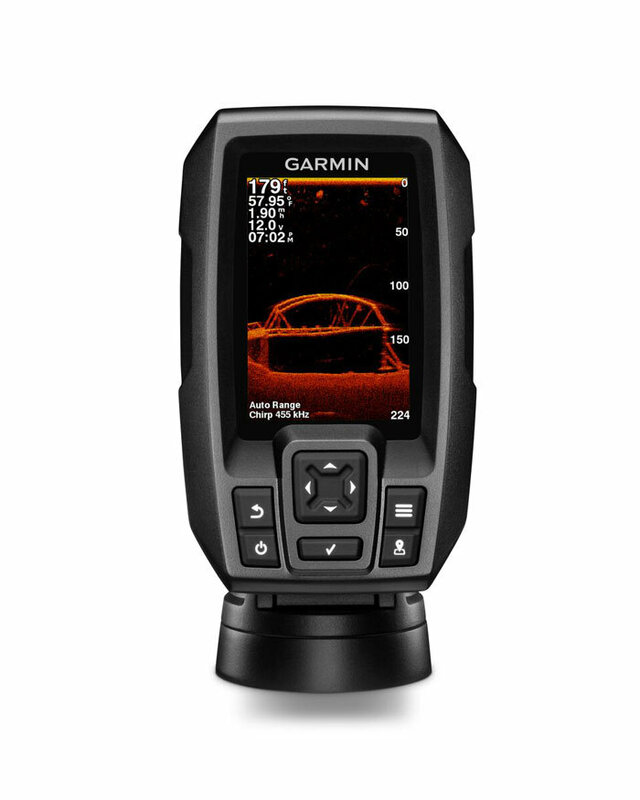 The new Striker fishfinder from Garmin: You can have it, for a mere $119.99. You’ve gotta love the way the price of technology falls over time. As in, it falls like a rock. Case in point: the new echoMAP series and Striker series, from Garmin. Both offer CHIRP-equipped down and side-viewing abilities, and neither is expensive. In the case of the Striker, it’s down-right cheap. Just a few months back we looked at some inexpensive fishfinders in Super-Cheap Fishfinders: The Good, The Bad, and the Ugly. And you may have noticed then that there’s a slew of new units on the market that are shockingly inexpensive. The Striker continues this trend with an MSRP of $119.99 for the 3.5″ unit, and a $499 price tag on the 7″ unit. Like other new inexpensive units that benefit from trickle-down technology, the list of features is rather shocking: color LCD screens, CHIRP-style multi-frequency pings, side-scanning, and so on. The Striker adds in one other unexpected bonus, a built-in GPS receiver. (Yes, even on the $119.99 unit). While this isn’t a full-blown chartplotter, it does give you the ability to mark waypoints and keep track of trolling or drift speeds. Step it up a notch to the echoMAP series, and you’ll find a line of 4″, 5″, 7″, and 9″ units that add complete chartplotter functionality along with built-in chartography. Yet they still begin at a surprisingly low number ($299). And the echoMAPs also have NMEA compatibility, so you can use them to display things like engine data, or autopilot into. Are these fishfinders as high and mighty as those CHIRP units that cost thousands of dollars? Of course not. But their on-the-water performance is light-years ahead of the inexpensive fishfinders we had just a few years ago. The list of features they boast is about 10 times as long. And thanks to new user-interfaces, these things are easier than ever to use. When you get one, don’t hesitate to toss the instruction booklet right in the trash—trust me, once you get past installation, you won’t need it anymore. So if you have a jon boat or a small center console with no fishfinder onboard, what are you waiting for?